A near-staple for anyone who cares about Gille de Rais. On call, as her GB1 ability, CB1 to soulcharge 2, then if you have 6 soul, draw a card as well, then if you have 10 soul, unflip a damage. The 8k base may turn you off initially, but to be honest, when a 6 soul threshold means you can CB1 for a +1 as well as potentially get it for free, I'd take it. If you don't like the idea of a weak base Doreen the Thruster exists too. 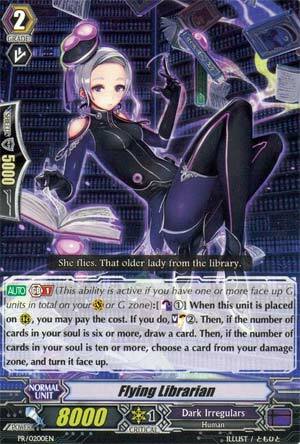 Staple for G-Dark Irregulars, but also useful for other decks if you can work with the initial low power. Now this is really good. A slightly better version of the House of Amon soul chargers, if you don't run the House of Amon. CB1 to SC2, and if you have six in soul, stupidly easy to do for Dark Irregulars, draw a card. 10 when you use it? You unflip a damage, effectively making this a Soul Charge 2 and Draw 1 when placed on R.
Sadly, it needs GB1 to work, so, a bit slow, but, on the other hand, much greater chance of getting the skill for free off when you do use it.